Socialism is often conflated with authoritarianism. But historically, socialists have been among democracy's staunchest advocates. A generation of Americans has been taught that the Cold War was one fought between freedom and tyranny, with the outcome decisively won in favor of democratic capitalism. Socialism, of all stripes, was conflated with the crimes of the Soviet Union and doomed to the trash heap of bad ideas. Yet many socialists were consistent opponents of authoritarianism of both left and right varieties. Marx himself understood that only by the power of their democratic numbers could workers create a socialist society. To that end, the Communist Manifesto ends with a clarion call for workers to win the battle for democracy against aristocratic and reactionary forces. Legions of socialists followed this path, ardently defending political and civil rights, while also fighting to democratize control over economic and cultural life through expanded social rights and workplace democracy. Despite the common assertion that “capitalism equals democracy,” capitalists themselves, absent the pressure from an organized working class, have never supported democratic reforms. While universal suffrage for white men came to the United States by the Jacksonian period, European socialists had to fight until the end of the nineteenth century against authoritarian capitalist regimes in Germany, France, Italy, and elsewhere to achieve the vote for working-class and poor men. Socialists gained popular support as the most consistent supporters of universal male suffrage — and eventually, women’s suffrage — as well as the legal right to form unions and other voluntary associations. Socialists and their allies in the labor movement have also long understood that people in a dire state of need cannot be free people. Thus, the socialist tradition is popularly identified outside the United States with winning the public provision of education, health care, child care, and old-age pensions and within the United States for backing many of these struggles. 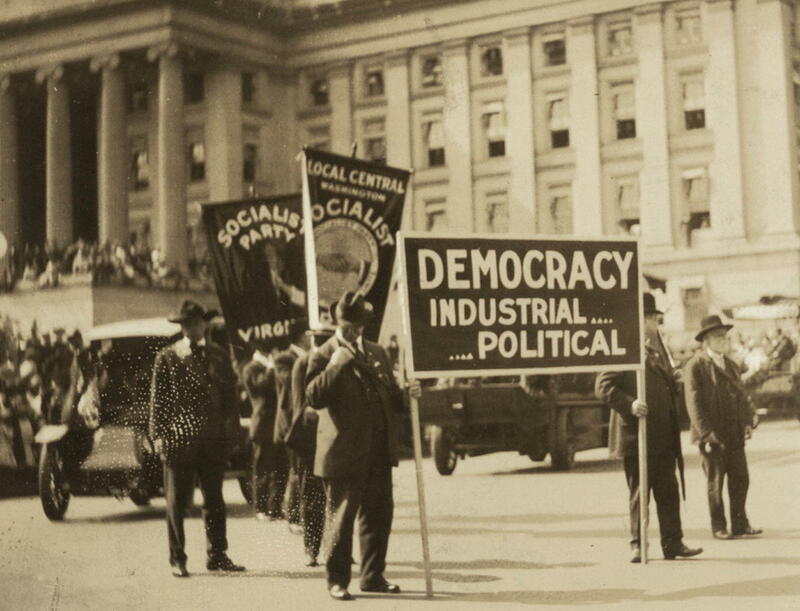 For many socialists, the support for democratic reforms was unconditional; but they also believed that the class power needed to restrain the power of capital had to be furthered so that working people could fully control their social and economic destiny. While criticizing capitalism as antidemocratic, democratic socialists consistently opposed authoritarian governments that claimed to be socialist. Revolutionaries such as Rosa Luxemburg and Victor Serge criticized early Soviet rule for banning opposition parties, eliminating experiments in workplace democracy, and failing to embrace political pluralism and civil liberties. If the state owns the means of production, the question remains: how democratic is the state? Luxemburg understood that the 1871 Paris Commune, the brief experiment in radical democracy that Marx and Engels referred to as a true working-class government, had multiple political parties in its municipal council, only one of which was affiliated with Marx’s International Workingmen’s Association. True to these values, socialists, dissident communists, and independent trade unionists led the democratic rebellions against Communist rule in East Germany in 1953, Hungary in 1956, and Poland in 1956, 1968, and 1980. Democratic socialists also led the brief, but extraordinary experiment of “socialism with a human face” under the Dubček government in Czechoslovakia in 1968. All these rebellions were crushed by Soviet tanks. The Soviet Union’s fall, however, hardly meant that democracy was won. Socialists reject the claim that capitalist democracy is fully democratic. In fact, the affluent have abandoned their commitment to even basic democracy when they felt threatened by worker movements. Marx’s analysis in The Eighteenth Brumaire of French capitalist support for Louis Napoleon’s coup against the French Second Republic chillingly prefigures capital’s later support of fascism in the 1930s. In both cases, a declining petty bourgeoisie, a besieged middle class, and traditional agrarian elites gained the support of capitalists to thwart rising working-class militancy by overthrowing democratic governments. The authoritarian regimes of the 1970s and 1980s in Latin America likewise drew on corporate support of a similar nature. Much of the prestige of the postwar European left and today’s Latin American left stemmed from their being the most consistent opponents of fascism. The capitalist argument that individual choice in the market equals freedom masks the reality that capitalism is an undemocratic system in which most people spend much of their life being “bossed.” Corporations are forms of hierarchical dictatorships, as those who work in them have no voice in how they produce, what they produce, and how the profit they create is utilized. Radical democrats believe that binding authority (not just the law, but also the power to determine the division of labor in a firm) is only valid if every member of the institution affected by its practices has an equal voice in the making of those decisions. Democratizing a complex economy would likely take a variety of institutional forms, ranging from worker ownership and cooperatives, to state ownership of financial institutions and natural monopolies (such as telecommunications and energy) — as well as international regulation of labor and environmental standards. The overall structure of the economy would be determined through democratic politics and not by state bureaucrats. But the question remains: how to move beyond capitalist oligarchy to socialist democracy? By the late 1970s, many democratic socialists recognized that corporate profitability had been squeezed by the constraints the labor, feminist, environmental, and antiracist movements of the 1960s placed on capital. They understood that capitalists would retaliate through political mobilization, outsourcing, and capital strikes. Thus, across Europe, socialists pushed for reforms aimed at winning greater public control over investment. The Swedish labor movement embraced the Meidner Plan, a program which would have taxed corporate profits over a twenty-five-year period to create public ownership of major firms. A Socialist-Communist coalition that elected François Mitterrand to the French presidency in 1981 nationalized 30 percent of French industry and radically enhanced collective bargaining rights. In response, French and Swedish capital invested abroad instead of at home, creating a recession that halted these promising moves toward democratic socialism. The policies of Thatcher and Reagan, which ushered in over thirty years of de-unionization and cuts to the safety net, confirmed the Left’s prediction that either socialists would move beyond the welfare state to democratic control over capital or capitalist power would erode the gains of postwar social democracy. Today, socialists across the world face the daunting challenge of how to rebuild working-class political power strong enough to defeat the consensus of both conservatives and Third Way social democrats in favor of corporate-dictated austerity. But what of the many governments in the developing world that still call themselves socialist, particularly one-party states? In many ways, one-party Communist states have shared more in common with past authoritarian capitalist “developmentalist” states — such as late nineteenth-century Prussia and Japan, and postwar South Korea and Taiwan — than with the vision of democratic socialism. These governments prioritized state-led industrialization over democratic rights, particularly those of an independent labor movement. Neither Marx nor classic European socialism anticipated that revolutionary socialist parties might most readily seize power in predominantly agrarian, autocratic societies. In part, these parties were based in a nascent working class radicalized by the exploitation of foreign capital. But in China and Russia, the Communists also came to power because the aristocracy and warlords failed to defend the people against invasion — defeated peasant armies wanted peace and land. The Marxist tradition had little to say about how predominantly agrarian and postcolonial societies could develop in an equitable and democratic manner. What history does tell us is that trying to force peasants who had just been given private land by Communist revolutionaries back onto collective state farms results in brutal civil wars that sets back economic development for decades. Contemporary economic reforms in China, Vietnam, and Cuba favor a mixed-market economy with a significant role for foreign capital and private landowning peasants. But one-party elites instituting these experiments in economic pluralism have almost always repressed advocates of political pluralism, civil liberties, and labor rights. Despite continuous state harassment, the growing independent labor struggles in places like China and Vietnam may revive the working class’s role in promoting democracy. It is in those movements, not in autocratic governments, that socialists place their solidarity. Of course, there also exists a rich history of experiments in democratic socialism in the developing world, ranging from the 1970s Popular Unity government of Salvador Allende in Chile to the early years of Michael Manley’s government in Jamaica that same decade. The Latin American “pink tide” in Bolivia, Venezuela, Ecuador, and Brazil today represents diverse experiments in democratic development — though their governing policies depend more on redistributing earnings from commodity exports than on restructuring economic power relations. But the United States government and global capitalist interests consistently work to undermine even these modest efforts at economic democracy. The CIA and British intelligence overthrew the democratically elected Mohammad Mosaddegh government in Iran in 1954 when it nationalized British oil. The International Monetary Fund and World Bank cut off credit to Chile, and the CIA actively aided Augusto Pinochet’s brutal military coup in that country. The United States likewise colluded with the IMF to squeeze the Manley-era Jamaican economy. Capitalist hostility to even moderate reformist governments in the developing world knows no bounds. The US forcibly overthrew both the Jacobo Árbenz government in Guatemala in 1954 and the Juan Bosch presidency in the Dominican Republic in 1965 because they favored modest land reform. For students of history, the question should be not whether socialism necessarily leads to dictatorship, but whether a revived socialist movement can overcome the oligarchic and antidemocratic nature of capitalism.